EXPANSION JOINT - EXISTING FIELD JOINT "A"
EXPANSION JOINT - EXISTING FIELD JOINT "B"
Helix® Low-Rise Adhesive is a two-component, construction-grade, polyurethane foam adhesive designed to adhere approved roof insulations, thermal barriers, cover boards and fleece-backed single-ply membranes to acceptable substrates. 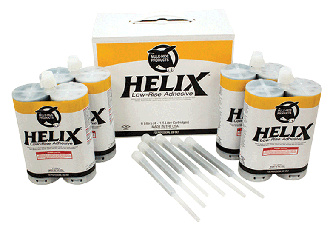 Helix Adhesive is VOC, CFC, HCFC and solvent free. Does Helix Adhesive look different than the other products on the market? Helix Adhesive is gray, which is unique in the industry. How cold can it be when I use Helix Adhesive? 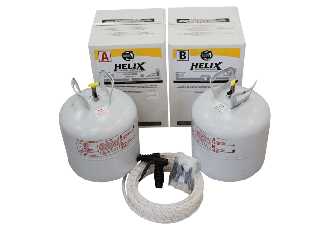 The substrate and ambient temperature must be above 32°F when using Helix Adhesive. 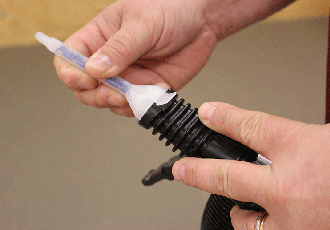 If temperatures are below 50°F, the adhesive must be kept warm before use. Can I full spray or splatter pattern Helix Adhesive? No. Helix Adhesive is applied in ¾" wide beads or ribbons spaced 4", 6" or 12" on center depending on the conditions of the project. What do I do if I need a listed system and it’s not offered with Helix Adhesive? Mule-Hide will issue a labor and material warranty on qualifying systems. If Mule-Hide has a listing utilizing the Helix Adhesive and the contractor uses a different manufacturer without prior approval from Mule-Hide, a warranty will not be issued. Must all of the asphalt be removed from the deck before installing Helix Adhesive? Helix Adhesive does not stick to new, or previously unexposed, asphalt that has a shiny appearance. Whenever shiny asphalt is encountered, the asphalt must be primed with CAV-GRIP prior to the installation of Helix Adhesive. How much more expensive is it to attach insulation with Helix Adhesive versus fasteners? Material costs to adhere insulation to a roof deck using Helix Adhesive is much more expensive than using screws. As a general rule, material costs to use Helix Adhesive is around 5 to 6 times more expensive than using screws when one layer of insulation is installed. 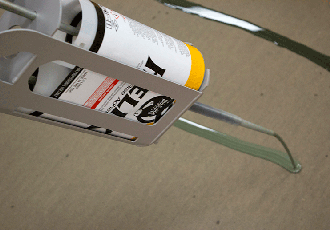 Unlike mechanically fastening insulation where only the top layer is fastened, each individual layer must be adhered when using Helix Adhesive. However, some of the major benefits to using Helix Adhesive can greatly reduce costs in other areas of the project. Does it matter what kind of tips are on the gun or cartridge? Yes, absolutely! Each manufacturer designs mixing tips to create the desired 1:1 ratio based on the properties of their product. You must use Helix mixing tips when using the Helix Gun Assembly or Cartridges. Failure to use Helix mixing tips results in off-ratio mixing and the Helix Foam will not properly rise. What membranes can be adhered with Helix Adhesive? 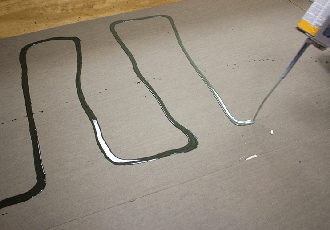 Only fleece-back membranes can be adhered using Helix Adhesive. Currently, Mule-Hide offers TPO, PVC, and PVC KEE HP in fleece back configurations. What is the shelf life of Helix Adhesive? 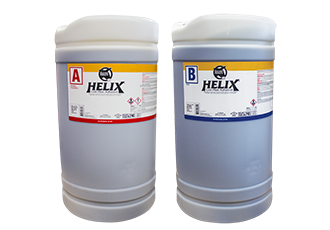 Helix Adhesive has a shelf life of approximately 12 months when stored in an upright position at 50°- 90°F in its original unopened container. Storage temperatures above the recommended range shorten shelf life. Do not store in direct sunlight or temperatures higher than 90°F, such as using it for tarp weight on a roof. Helix Adhesive should be store in a covered, secure location. Keep from freezing. Product stored below 50°F must be given sufficient time (minimum 24 hrs.) for the adhesive to warm up prior to use. Does Helix adhere directly to an existing PVC single-ply membrane? No. PVC is not an approved substrate for Helix Adhesive. In addition, Helix is not approved for attachment to existing EPDM single-ply membranes, acrylic or aluminum coatings. It is recommended that adhesion tests be done by Mule-Hide. Adhesion tests are scheduled through Mule-Hide Territory Managers. What is a positive adhesion test? Helix Adhesive tests are simple "shovel" tests. The existing substrate is prepared in the same manner as the specification and then a piece of the specified insulation is adhered using Helix Adhesive. Once cured, the insulation is pried off of the substrate with a shovel. A positive adhesion test is when the board breaks before the insulation peels off of the substrate. If specific uplift values are required, fully metered and measured pull tests can be performed based on ANSI/SPRI IA-1 Field Test Standards. Why are some adhesion tests "recommended" and others are "required"? 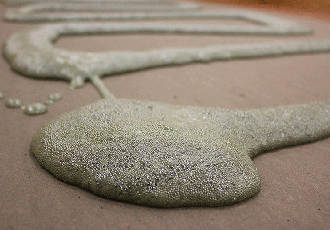 Low-rise foam adhesives have performed well for nearly two decades. Over the past two decades, experience in the market has created an industry accepted list of best practices. Mule-Hide recommends adhesion tests on those substrates that have a lengthy history in the market with known characteristics. Mule-Hide requires adhesion tests on substrates that do not have an established history in the market or have critical variables that, if left unaddressed, will adversely affect the bond of Helix Adhesive. As always, good roofing practice dictates that adhesion tests should be done on all projects to ensure a quality bond using foam adhesives, regardless of whether they are recommended or required.